Issued c.1740, London. Engraved by J. Basire. The City of Namur with the Castle and other Fortifications. Wonderful mid-18th century birds-eye city plan. 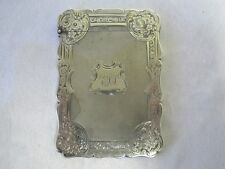 Engraved with lovely hand color. Trieste Italy Italia 1873 detailed old city plan map w/ key of important sites. 31" x 20". Very Good condition. Map had previously been folded, faint fold marks are visible. ANTIQUE MAP - (SUFFOLK) BY THOMAS KITCHEN 1764. MOUNTED READY FOR FRAMING. SIZE OF MAP. FEW MARKS DUE TO AGE ETC. WITH MOUNT O/D. ANTIQUE MAP - (SUFFOLK). BY J ELLIS C1766. MOUNTED READY FOR FRAMING. (THREE VERY SMALL HOLES IN MAP). SIZE OF MAP. FEW MARKS DUE TO AGE ETC. Get images that. make Supersized seem small. 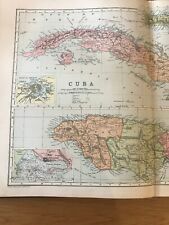 Victorian coloured map of CUBA and JAMAICA taken from GW Bacon's 1897 Popular Atlas Of The World. Published in London. Insets include Kingston, Havanna, the Leeward Islands and The Lesser Antilles. 1860 MAP OF THE UNITED STATES A LARGE ORIGINAL HAND COLORED MAP Published by S. Augustus Mitchell Jr. in 1860 from Mitchell's General Atlas. The image size is 21" X 13 1/2". Hand colored by the colorist that worked for Mitchell. The images incorporated into the plates and tables were drawn from the best available contemporary sources, including the works of Dapper, Chardin, de Bruyn and Le Hay. Publication: Atlas Historique, ou nouvelle introduction a l'histoire, a la chronologie & a la geographie ancienne & moderne. Provenance:The Authentic Map Directory of London and Suburbs, Published by Geographia (1923) Ltd. This is the first edition of this directory. Original colour, suitable for framing, good margins surrounding image. Cornell's Primary Geography, Forming Part First of a Systematic Series of School Geographies. Revised Edition. By S.S. Cornell. Replogle 12" WORLD NATION Series Globe. Globe spins easily & tilts. Raised map. It’s not a big deal or even that noticeable but I looked it over very carefully &! like to detail any and all flaws. Beautiful Antique Map on quality paper EXCELLENT condition and rescued from a disbound Atlas THERE WILL BE ANOTHER MAP ON THE REVERSE. If you like the item, but do not like the price. QUICK SALE AT A FAIR PRICE. I have listed a 1894 German Book about Spain. There is a map of Spain & Portugal as well. The front cover is beautiful. With Large Unexplored Region. 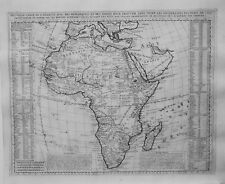 An antique map of Africa published in a school atlas by Francis Junius Huntington, 1830. - Hand-Colored 1830 -. By Francis Junius Huntington. From the Atlas, designed to illustrate the Malte-Brun school geography. Issued 1867, Gotha Germany by Perthes for Stieler. Mid-19th century engraved map, with original outline hand color. South Braintree Thayer Norfolk County Massachusetts 1888 large detailed map. Trieste Italy Italia 1873 detailed old city plan map w/ key of important sites. Eilers Ltd made in USA. "Palestine 10" written on reverse, slight show through - see pic. Height : 131cm. Scal 1:24 000 Map Size: 27" X 22". Scale 1:24000 Map Size: 27" X 21.5". Map Size: 41.5" X 30". CONDITION: Excellent Condition. A couple small stains on back that don't show through. Scale 1:24000 Map Size: 27" X 22". Neues AngebotVintage Warren County, Ohio Hand Drawn Map 1936 Survey Military State Dept. See pics. Mostly hand drawn map mounted on cardboard. I will combine shipping no returns Email me with questions do not assume anything. I only ship overseas using eBay global shipping. Scale 1:250,000 Map Size: 39" X 22". MAP OF FLORIDA AND NORTH AND SOUTH CAROLINA A LARGE ORIGINAL HAND COLORED MAP Published by S. Augustus Mitchell Jr. in 1860 (see picture 3) from Mitchell's Atlas. The image size is 14" X 11 1/2". Blank on the back. The image size is 11" X 9 1/4. Hand colored by the colorist that worked for Mitchell. In VG condition. Removed directly from a broken Atlas. With wide margins on all 4 sides. The gutter edge has a 1 5/8" margin and was detached showing the thread holes. 1861 MAP OF WASHINGTON D.C. LARGE ORIGINAL HAND COLORED MAP Published by S. Augustus Mitchell Jr. in 1861 from Mitchell's General Atlas. Drawn by W.H. Gamble. The image size is 13 1/2" X 11". Blank on the back. 1863 MAP OF OHIO AND INDIANA A LARGE ORIGINAL HAND COLORED MAP Published by S. Augustus Mitchell Jr. in 1863 from Mitchell's General Atlas. The image size is 14" X 11 1/2". Hand colored by the colorist that worked for Mitchell. Issued c.1580-1600, Basel by Munster. "Cosmographia- Beschreibng Aller Lander Durch". Two cherubs hold the city crest aloft top center, endless countryside details. There are even people hanging from the gallows at lower left! This is an Olde World Globe in great condition! It is 10" tall and two pieces. Globe rotates. The image size is 18" X 14 1/8". Hand colored by the colorist that worked for Mitchell. In VG condition. Removed directly from a broken Atlas. With good margins on all 4 sides. The bottom edge has a 1/2" margin. It is titled, “Letter from The Secretary of War, Transmitting a Report of a Survey of Kennebec river, &c.January 13, 1838. Included is the often lost map/chart of the river between Augusta, Maine and Gardiner, Maine. Issued c.1816. 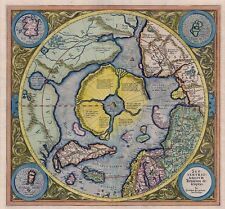 Drawn and engraved for Thomson's New General Atlas. Peru, Chili and La Plata. Excellent large format early 19th century engraved map, with lovely original hand color. South Braintree Thayer Norfolk County Massachusetts 1888 large detailed map. A New Map of the Circle of Swabia, from the Latest Authorities. Issued 1799, London. Engraved by John Cary. Fordham, John Cary, pp. 77-82. South Braintree Thayer Norfolk County Massachusetts 1888 large detailed map. Issued 1824, Milan by Pietro and Giuseppe Vallardi. Based on Arrowsmith. 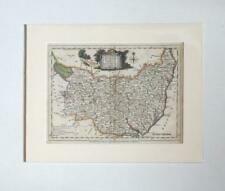 Scarce early 19th century Italian engraved map, with lovely original outline hand color. South Braintree Thayer Norfolk County Massachusetts 1888 large detailed map. Issued 1790, Paris by Brion & Desnos. Engraved by Chambon. Trieste Italy Italia 1873 detailed old city plan map w/ key of important sites. Attractive 18th century engraved map, with lovely original hand color. Issued c.1855, London by Tallis. Map drawn and engraved by J. Rapkin. Illustrations drawn and engraved by H. Winkles. Includes four vignette views of Georgetown harbor, Christmas Cataract River Berbice, New Amsterdam harbor, and Ataraipu or the Devil's Rock. DUSSELDORF, KOLN, BONN, KOBLENZ, GERMANY, BERTIUS. by Petrus Bertius. An original early 17th century copper engraved miniature antique map of the Rhine Valley, Germany by Petrus Bertius. Petrus Bertius 1565 -1629. 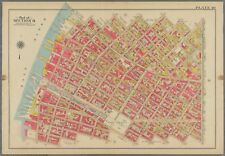 This is an original 1904, Plat Atlas Map of Wilkesbarre (8th Ward), Pennsylvania. It includes an Index for Points of Interest and Illustrations of popular areas and Principal Buildings. It is in Mint condition. Terrestrial Globe 12". Made by (see photo of label); C. S. Hammond & Co. Has the dates of (see 2nd & 3d photos) ; Amundsen 14 Dec 1911 and Scott 18 Jan 1912 (Note; these dates are located where the rod goes thru the center of globe and goes thru the Country of Antarctica. ). I'm not sure if this is a first (1695) or second (1722) edition. The map is a first edition, published in Camden'sBritannia in 1695. The map is drawn at a scale that allows the county to be depicted in impressive detail. The short coastline along the northern side of Morecambe is an added feature. 1830's Map of the County of Gloucestershire - taken from Pigot & Co's British Atlas Comprising the Counties of England (upon which are laid down all railways completed and in progress). Steel engraving. The Saxon Heptarchy by John Speed. Englifhe Saxons efpecially during their Heptarchy". 30” x 20” Photographic Print. 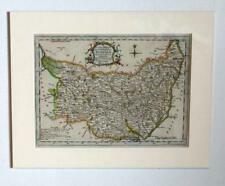 This reproduction map has been scanned from an original antique and art worked to a very high standard of production. Folds as issued. My price is based on the rare condition and scarcity of this map. This map is from my personal collection. Strikingly interesting and highly detailed map. I cannot stress enough how beautiful this map is up close compared to the photos that you see. Neues Angebot1932 Map PICTORIAL PLAN Northumberland DURHAM Yorkshire LANCS Lakes LINCS etc. Original vintage pictorial Esso map c1932 titled Pictorial Plan of the North. Moor, Mountain and Lake District. A colourful and very attractive pictorial map which features a decorative cartouche and compass; a table of distances in. Plus much more; see main description. 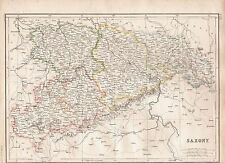 ROUGH Antique 1810 Pinkerton Modern Atlas Map Of Prussian Dominions - 33.5"x22"
Vintage Warren County, Ohio Hand Drawn Map 1936 Survey Military State Dept.